For more than a quarter of a century, Vermont Castings has creating handcrafted cast iron stoves and fireplaces. 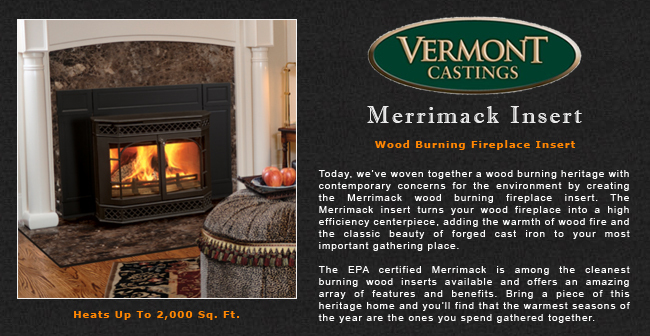 Bring home a Vermont Castings wood stove or fireplace today! 350 sq. in. viewing area — 60% larger than our competition in the same class. Firebox (gasketed construction), front, and door constructed of the best material for wood-heating; quality cast iron from our Vermont foundry. 6” flue collar is detachable, secured from outside or inside the firebox, and adjustable for vertical or 30 degree offset. Quiet, high-volume heat-activated variable speed circulation fan is included. The power cord can be directed to either side. The fan can be easily cleaned and serviced from the front of the insert. The fan improves circulation of the room air, but is not required to provide heat. Northfield Cast Iron Surround (NORCSCB) available in Classic Black for a more traditional hearth look. Exeter Steel Surround (EXSSCB) available in Classic Black for a clean, contemporary finish.